Dual audio playback in two independent decks. Waveform display with beats, cue and loops markers and zoom. Instant beat-matching and synchronization (one-click). Precise automatic BPM counter on the fly (for all genres between 70-155BPM). 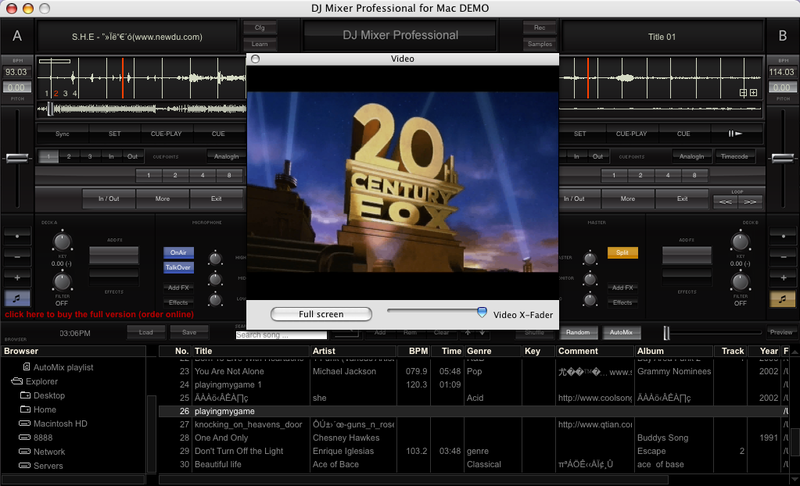 Mix your favorate video clips (AVI, MPEG...) together with audios to have a professional mixing output. Compatible with iTunes playlists, Mix your music from iTunes. Time-coded vinyl/CD support and Analog input. Supports MP3, OGG, WAV, CDA, AIFF, AU, WMA*, M4A**, MP4**, MOV, WMV, MKV, AVI, MPEG format. Browsing system with unlimited lists, disk explorer and database. External hardware controllers support and MIDI. Ability to use a microphone (TalkOver + OnAir). Audio CD support (intelligent cd detection/loading). Fixed some problems with the previous 2.0.2 release and support for Karaoke CDG files (mp3 + cdg files), FLAC audio, lots of stability improvements and several small bugs fixed.